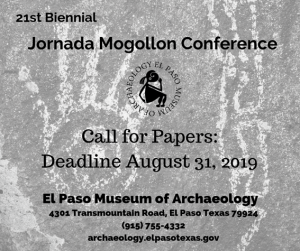 Proposals are now being accepted for the 21st Biennial Jornada Mogollon Conference to be held October 11th and 12th, 2019 at the El Paso Museum of Archaeology in El Paso, Texas. Abstracts are due August 31, 2019. Proposals for individual papers or sessions are now being accepted on any history, culture, or archaeology topic in the Jornada Mogollon region (including Casas Grandes). Presentations will be 20 minutes in duration with five minutes between presentations. Papers accepted for presentation are eligible for publication in the conference proceedings volume. There will be no poster sessions.